Treat your kitty to the best of both land and sea with Hartz Delectables Senior 10+ Stew & Bisque Variety Pack Lickable Cat Treats. Each case comes with six packets of Tuna & Chicken Bisque recipes and six Chicken & Tuna Stew recipes. The Bisque offers a smooth texture, while the Stew delivers a hearty consistency that’s sure to please the finickiest felines. 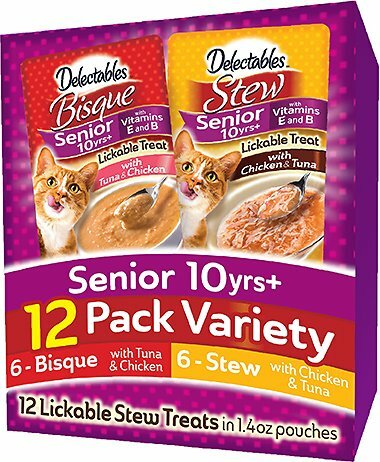 These delicious and nutritious gourmet lickable cat treats are crafted with either real fish or chicken for the high-quality protein your BFF deserves and is specially crafted for senior sidekicks 10 years and older! Simply open the pouch, pour it into a bowl, and let him enjoy the rich reward as a snack between meals or as a tasty kibble topper. Any way you serve it, these purr-worthy treats will leave your cat licking his chops! Lickable treats made with real chicken and tuna and blended into a smooth bisque or a hearty stew. Comes with 12, 1.4-ounce single serve pouches and two irresistible flavors. The moisture-rich cat treats help add healthy hydration to your cat’s diet. Easy to serve—hold the edges of the pouch with both hands and gently shake to move contents to bottom, tear open, and pour into a bowl. Makes the purr-fect reward, snack or tasty topper for seniors 10 years and older. Tuna & Chicken Bisque Recipe: Water, Tuna, Chicken, Natural & Artificial Flavor, Tapioca Starch, Natural Tuna Flavor, Guar Gum, Vitamin E Supplement, Annatto Extract Color, Pyridoxine Hydrochloride, Thiamine Mononitrate, Carmine Color, Riboflavin Supplement, Vitamin B12 Supplement. Chicken & Tuna Stew Recipe: Water, Tuna, Chicken, Natural & Artificial Flavor, Tapioca Starch, Natural Tuna Flavor, Guar Gum, Vitamin E Supplement, Carrageenan, Xanthan Gum, Locust Bean Gum, Pyridoxine Hydrochloride, Thiamine Mononitrate, Riboflavin Supplement, Vitamin B12 Supplement. 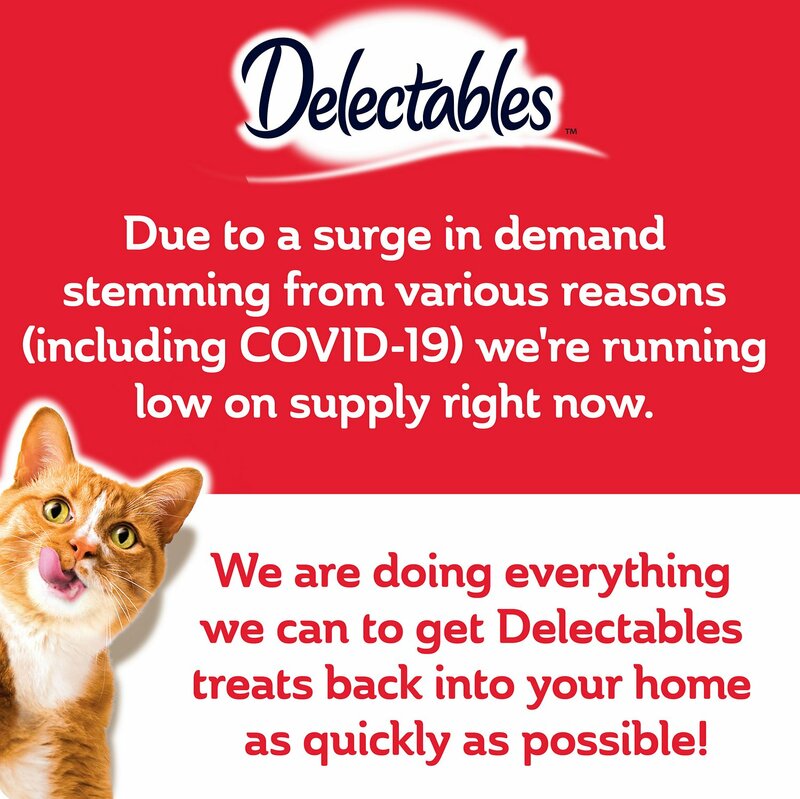 Delectables Lickable Treats are intended for intermittent and supplmental feeding only; this product may be fed daily along with a complete and balanced cat food diet. I purchased this to try to entice a sick kitty to eat. Sadly, he turned even this down. After losing my sweet furbaby, that left me with an entire box, which, I'm happy to report, the other kitties have decided they like - a lot. I've added this to their "treats". I have an older outdoor cat who eats well and gets all of his shots, but I like to give him one of these packets at least every other day to give him some extra vitamins. He likes both varieties, and he sees it more as a treat! Older cat who needs to take liquid medicine. Put in the bisque and she takes it no problem. Doesn’t like the stew as much though. So I donated to shelter.